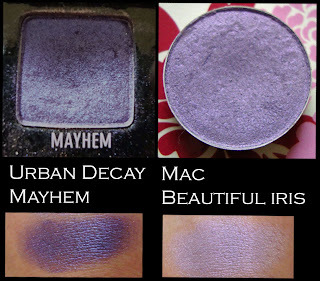 The purples that I opted for were Urban Decay's "Mayhem" and Mac's "Beautiful Iris". Mayhem is a gorgeous opalescent dark purple with hints of mauve, it has a slight sheen with no glitter which is my all time favourite purple. Beautiful Iris is a pale lavender with a slight opalescent pinky finish. It's quite powdery but when packed on top of UDPP it's fine. I love playing with different tones of purple, as it really makes hazel eyes pop... Do you have hazel eyes and never wear purple? UH OH where have you been? You NEED to wear it. Face: Bobbi Brown tinted moisturiser. Max Factor lasting performance foundation as under eye concealer as it's too light for me. Eyes: Mac Beautiful Iris e/s all over lid. UD Mayhem e/s on outer V, blended into crease and lower lashline. Mac Naked Lunch e/s to highlight. Urban Decay 24/7 liner pencil in Lust on upper lashline and waterline. Maybelline Pulse perfection mascara. I love purple, :) believe it or not, but as a kid I HATED it! Cheeks: Barry M Natural Dazzle bronzer to contour. Barry M blush in Terracotta on apples of cheeks. Will be reviewing the blush soon. Lips: Nars Turkish Delight lipgloss and L'oreal Cappuccino lipliner smudged in. What are your favourite colours to wear on the eyes apart from neutrals? Gorgeous use of purples, love it on brown eyes too, but I can never get my eyeliner to look as good as yours. Do you think it might be possible for you to do a to step by step on applying eyeliner? i love purple! I think they make all eye colors pop! I love purples too and UD Mayhem is also one of my faves. aww nice colors, I love purple on you, very pretty. LOVE! Purple looks AMAZING on you! Erm, your lashes are SCANDALOUS!! I DIE!! very beautiful. I love the colors. this look actually gave me courage to wear brighter purples... when I wear purple -which is rare- I usually stick with muted plums. who'd say bright purple could look so beautiful? your eyes just pop, it's amazing! Wow, what a combination..wild purple and stunning eyelashes..sooo pretty! That's funny. I hated purple as a kid too.. I actually didn't start liking it until a couple of years ago.. now I LOVE IT. I love purple e/s on you.. so pretty!! And your lashes look amazing! I want to try Lilash so bad.. but I know my eyes are really sensitive so it scares me a bit. I never used to understand 'make-up',even with my wife's trialing different combo's ...'yup,that's nice too,isn't red better? 'my usual quip.I want to thank you for being the Samurai Women that you all are, for your dedication to the daily pursuit of perfection.Taking inspiration from that purple sky is just mind-blowing,your helping boost/build women's confidence is immense.Positive energy always multiplies,the comments here prove that...just feel it!PS. thank you for the palette tip on the other post. i LOVE how you do purple..it suits your eyes so well!!! WOW! The eyelashes look amazing.. and purple really does make your eyes "pop". Wow this looks amazing!! I am loving purple at the moment, on eyes and nails! You look stunning, I love how that colour looks on your skin and your lashes are to die for! Purple does look great on you hun.I love to electric eel it looks great with my dark eyes. Absolutely stunning, your eyes look so unreal, they 're like glowing from within!!!! Beautiful and perfect for the season! Your eyelashes are a million miles long! Awesome blog! Hi there! I'm a first time poster. Your eyes look amazing and your lashes out absolutely stunning! Have been using Lilash about 10 days now, I can't wait for my lashes to look like yours! the purple looks amazing! I want to play with purples now!!! And the eyeliner too is really nice! I must get it. wow thank you all so much for the kind and wonderful comments, i am humbled for words. I hope I can inspire you all to try out purple :) thank you so much again, i really appreciate the motivation and support. my goas, this purple look is one of the most gorgeous i haveseen on blogs and youtube!